The answer to specific cleaning needs where the stains and grime are adamant lies in this power-packed, gas operated pressure washer. The Generac 6024 is perfect not just for cleaning your backyard and driveway, but also for cleaning the stubborn dirt and grime in your stables (in case you own horses) and the tell-tale oil and grease stains found on boats and ships. This is a gas powered pressure washer equipped with a powerhouse of an engine with 212cc displacement. The Generac 6024 comes with a selection of five nozzle tips with varying degrees of pressure and can be fitted quite easily. The 30-foot hose that comes as an attachment helps to use the washer without any restrictions. The sturdy frame is built to last and can be easily maneuvered around the house to reach even the trickiest spots effortlessly. What’s more is the equipment comes with a 2-year warranty, allowing you to go on with your cleaning tasks without any hassles. Although it is not a push-button start type, the engine can be easily started by the pull-start method. However, at times it may require additional attempts to start. Otherwise, the equipment is portable and easy to maneuver around the home and can be put to multiple uses like cleaning the backyard and driveway, walls, roof-tops, gutters and other areas that need cleaning frequently. The powerful engine ensures dirt and grime are removed easily. As the equipment is gas operated, it is prone to be noisier than its electrically operated cousins. The Generac power washer is actually noisy and way above normal tolerance levels. The racket could disturb the neighborhood, in addition to leaving a jarring note in your ears. The best solution is to use ear-muffs before switching on the pressure washer in order to ensure your ears are well protected against noise pollution. Although mufflers can be added to abate the noise to an extent, users need to learn to live with the noise while using this equipment. Quite naturally, this is a pressure washer designed to be used outdoors and never indoors. When it comes to power, the Generac 6024 probably has no match in this category. As it is gas operated and comes with a capacity of a whopping 3,100 pounds per square inch (PSI) pressure, it is ideal for cleaning the most stubborn stains. Added to this is 2.7 GPM, which displaces 2.7 gallons of water per minute, assures that any cleaning task is taken care of efficiently. Although it is a domestic pressure washer the motor is extremely powerful and so is the axial cam pump, rendering cleaning tough stains and grime very easy. The Generac 6024 is the perfect answer to the most daunting of cleaning tasks around your home. It efficiently cleans driveways and backyards, removing even microscopic stains left by oil or grease on any sort of surface. Its high-pressure water jets come with deep penetrating power that makes all cleaning tasks incredibly easy. The selection of five nozzles, each meant for a specific task, helps clean adamant stains with consummate ease. Be it a wooden surface or hard concrete, this pressure washer washes and cleans any surface with perfection. This pressure washer is built to last. The sturdy welded frame is built to take the rigors of use in all kinds of terrain, and the equipment can last a lifetime without any hassles. Designed and engineered for longevity, the equipment can withstand rough use inside and outside your home. The rugged design and the powerful motor, mounted on a tough frame ensure that the equipment can stand the rigors of outdoor use and the test of time successfully. Engineered to last a lifetime, the piece of equipment is durable with no compromise on performance. One good reason for the popularity of the Generac 6024 is the prompt after-sales support that is offered. With quick responses, and efficient troubleshooting small issues can be taken care through over the phone customer support. The service is available 24/7, making it all the more attractive and beneficial. While the equipment is designed to run without any issues, help is at hand during emergencies, and requests for replacement of parts are met efficiently. The Generac 6024 has a capacity of 3,100 pounds per square inch (PSI) with 2.7 GPM, which is a gas powered pressure washer perfect for domestic use. It is non-CARB compliant and comes with a powerful Generac OHV engine with a horizontal shaft, the engine and pump are placed at the same level, enabling easy hose connections. The frame is sturdy and welded to perfection, assuring long life, and is perfectly designed for easy storage anywhere in the house. Easy to use controls, with simple buttons for On/Off, and separate buttons for fuel shut-off and choke. All-terrain equipment, mounted on large wheels, ensuring easy maneuverability over difficult terrain. This pressure washer is an outstanding product, and is tough on stains and grime, yet is gentle on the surface that is being cleaned. You can pressure-wash your jeep or car and have it spanking clean, without any fear of the paint getting ripped off. 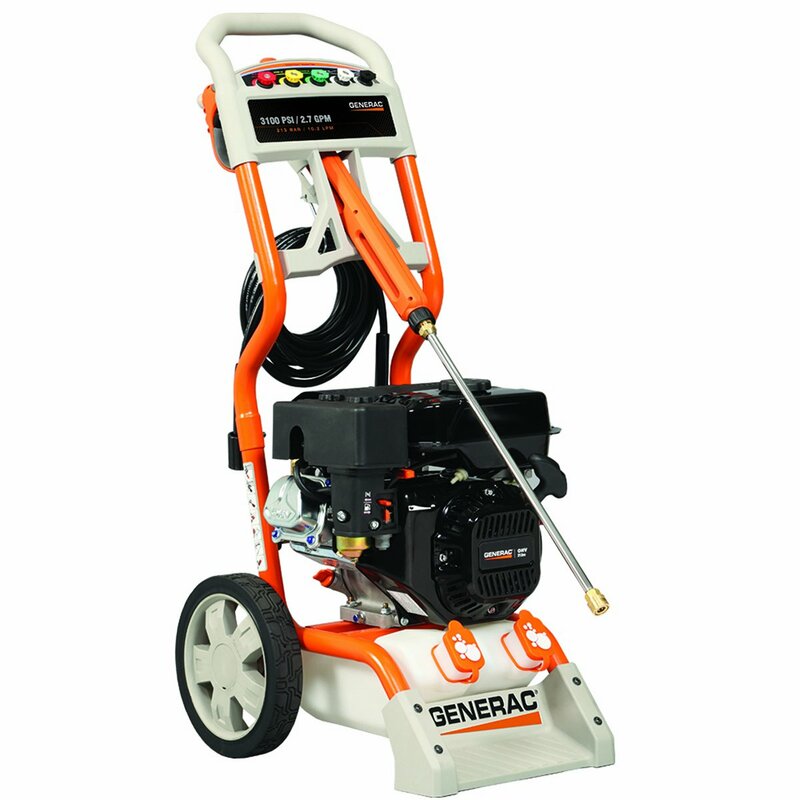 The Generac 6024 is a gas operated pressure washer and has to be pull-started each time you want to use it. Unlike the push-button electric start, the pull-start may not work at first pull each time, and can be exasperating at times. Affordably priced at around $380, the Generac 6024 appears to be a great bargain. The sturdy design and build are definitely the major plus points. The noise levels being way above the tolerance limits, they are probably the only dampening factors with this equipment. However, this is offset with the power the washer packs, which is much more when compared to a similar electrically operated pressure washer. This makes it an ideal choice where there is need to clean up adamant stains that recur frequently. The ease of use is another plus point that cannot be ignored.